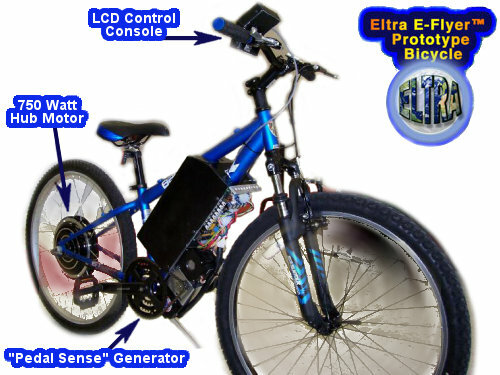 The Eltra® E-Flyer™ is the first True Series Hybrid Electric Bicycle to provide all of these features combined into a single bicycle. “Auto-Gear” automatically changes gears to maintain a user specified constant pedal speed. “Boost” mode uses the batteries to double the energy from the pedals. Rides like a normal bicycle with exclusive patent pending “Pedal-Sense” Technology. Allows energy from all pedaling to be added to the “Cruise” speed. Convenient Console on handlebar within reach of right thumb. Security Access Code prevents thieves from riding bike when locked. 750 Watt drive motor (1 Horsepower) delivers plenty of power to climb hills. 48 Volt 10AH Nickel-Metal-Hydride battery pack standard. At least 20 miles per charge without pedaling. Regenerative Braking helps recharge batteries when stopping. Integrated 4-hour battery charger with automatic shutdown. Optional 1500 Watt Off-Road Sport dual motor drive kit. Optional Headlight, Stop and Turn Lights. This Patent Pending system eliminates the derailleur, freewheel and ratchet. Instead, the pedal turns a generator that generates electricity to recharge the battery. The E-Flyer's computer senses the pedals energy sending this information to the drive motor. The E-Flyer's gears are changed electrically by a unique generator design. When the Cruise mode is on, any energy generated from the pedal is electrically added to the Cruise, thus allowing the E-Flyer's rider to pedal at any desired speed when using the Cruise. This increases the speed and the distance per charge. The Auto-Gear mode automatically changes the gears to maintain a constant pedal speed, which is easily set by the E-Flyer Console. The Boost mode uses energy from the battery to double the energy from the pedal and double the speed of the bike. Electric Bicycles currently on the market have a motor that drives one of the wheels in addition to the bike's pedals and derailleur. When these motors are running, the rider has to pedal faster than the motor or they're just spinning the derailleur's ratchet. Therefore, the rider must choose whether to pedal or run the motor, but cannot do both together efficiently. In addition, the old mechanical gears have to be constantly repositioned to stop the derailleur from grinding the chain. Whenever the bike is stopped, the gears have to be manually banged down to first gear while the bike is still moving. Eltra's new E-Flyer eliminates all of these problems, brings a new exciting dimension to bicycling and will be available in 2009. All Rights Reserved Reproduction in whole or in part without permission is prohibited.